Paddling the Colorado River through the town of Columbus you have the opportunity to see wildflowers, birds, turtles and more! This 6.5 mile trail can take anywhere from two to five hours to complete, and the peaceful waters and calm rapids will give you a wonderful day on the river. The put-in for this trail is at the 71 (Business) crossing under the North River Bridge. Look for signage directing you to the "boat ramp." Note: The Beason's Park take-out is closed due to damage sustained from Hurricane Harvey. 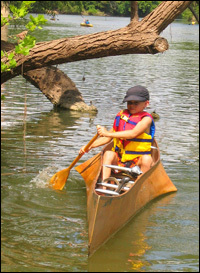 Paddlers may contact Frank Howell at Howell Canoe Livery, who has developed an alternate take-out until repairs can be made. The take-out is at Beason's Park, where you can rest at one of the many shaded picnic tables. You will also find free parking, restrooms and a pavilion. 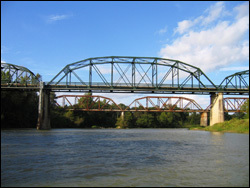 Beason's Park is located on Hwy 90 (Walnut Street) near the East River Bridge, just one block from downtown Columbus. On this stretch of the Colorado River you will see a mix of gently sloping to steep sandy banks, flat flood plains, and tree-lined ridges with mature trees. Enjoy this wide, open, peaceful trail with a few calm rapids and multiple islands great for picnicking during first third of the trail. You will pass several cattle ranches and very few houses as you paddle. Look forward to a spectacular wildflower display during the spring. Light line is recommended if you like to fish for Alligator gar, Bluegill, Buffalo, Carp, Chad, Channel catfish, Guadalupe Bass, Longnose gar, Sunfish, Yellow catfish, all of which have been spotted on this trail. Shiners and Red tail grey horse are also common. Bring your binoculars and field guide to enjoy birding. You could spot vultures, cardinals, egrets, flycatchers, herons, hawks, Ibis, killdeer, and even Roseate Spoonbills. Among the many trees, look for Bald Cypress, Box Elder, Buckeye, Cottonwood, Sycamore and Willow. You will also see an interesting mix of flowering Hibiscus and Button-Bush, Arizona Trumpet and Kudzu Vines, and a variety of Cactus. If it�s sunny, you might see turtles basking on a log or a water snake. The state's largest, flat-floored opera house, the site is home to a museum, the Visitor's Center and Chamber of Commerce, and monthly dinner theater. Attractions include a French Mansard copper roof, painted curtains and the original bank vault. 425 Spring Street, downtown Columbus. Set among magnolia trees in center of town, the structure was built in 1891 in Second Empire style with locally made brick. It features a Neo-classic copper dome and a working, four-face Seth Thomas clock. A magnificent stained glass dome is above the original 1890 judge's bench, bailiff box, and witness stand in the District Courtroom. Courthouse Square, downtown Columbus. In 1848, Scotsman Robert Robson built a castle on the river and housed local and itinerant artists. The castle washed away in a flood, but art lovers are still welcome to visit this gallery which is home to a permanent collection, rotating exhibits and workshops for all ages. 1014 Milam Street, downtown Columbus. A tribute to American pop culture, this collection features more than 2,000 representations of the jolly elf. 604 Washington Street, Columbus. The historical site of Beason's Crossing. Both General Sam Houston and the Texian Army, and General Santa Anna and the Mexican Army, passed through the area before meeting in San Jacinto where the final battle of Texas' struggle for independence took place. Today, this 24-acre oak-lined park is the rallying point for bike rides and runs, and is a take-out point for canoeists and kayakers. Just ¼ mile east of Columbus on Hwy 90. 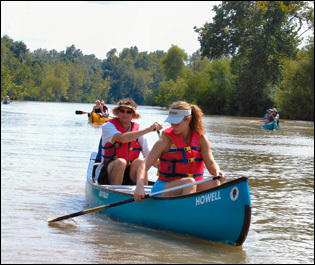 Columbus' sole canoe livery, this privately owned and operated business includes an indoor-outdoor events facility and canoe/kayak/ tube rental. The facility is host to events throughout the year including the annual Colorado River Canoe Marathon and periodically the Texas Canoe Racing Championships, among others. 804 Robson Street, Columbus. This trail was made possible through a partnership with the Columbus Convention and Visitors Bureau, Colorado County, the Lower Colorado River Authority, the Columbus Community Industrial Development Corporation, Howell Canoe Livery, and Texas Parks and Wildlife Department.